If you’ve followed the folk and Americana genres, or read Pat Pattison’s books on songwriting, you know who Gillian Welch and David Rawlings are. 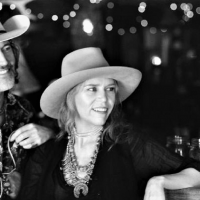 Since Revival, their first album in 1996, Welch and playing partner David Rawlings have become Americana legends. One of the primary reasons for their success is their song craft. Gillian Welch is an object writer. She’s a chronicler of detail and imagery. She uses that approach to bring rich, emotional textures to their songs. The characters that wade through the murk of the imagery have depth, and bring a looming weight to every line in the lyric while Rawlings finds the organic matter and silt that permeates and holds the musical foundation. “The Way It Will Be” from the Grammy-nominated album The Harrow & The Harvest is no different. Utilizing Gillian Welch’s lyrics and David Rawlings’ evocative music, they turn a conversation with no scene into a scene comprised of haunting imagery that enhances the song’s larger message. How? Let’s break it down! Like many of Welch and Rawlings’s songs, there’s a darkness to the lyrics and the tone of the music that places an immediate focus on the fear, despair and wanting of a hauntingly flawed character. She’s speaking to someone, but you have a sense that the conversation is actually internal. So, while the point of view is direct address, the perspective is the “you” in the speaker’s own head. By making the perspective internal, it affords the speaker an opportunity to say whatever she would like without judgement from another. It also give her an opportunity to speak freely about how she feels without couching her words to spare someone’s feelings. A direct address song with an internal perspective provides you with a much more introspective and personal way to evoke your message than direct address with an external “you.” It is also a way to achieve an omniscient third person point of view, which tends to sound very detached and storyteller like, but still maintain a personal connection. None of it has to be explained, after all, it means something to the main character/speaker, and I’m willing to go along as the listener because the song’s music is carrying the saddened mood and struggle. I’m still in – I don’t need all the “first this, then that-ness” that strips many songs of emotional depth. The main character of the song is a jilted lover lamenting her loss with a sense of yearning that begins as an admission of confusion: “I lost you a while ago, but still I don’t know why.” The meter of the line keeps the speaker in an almost passive tone. The hard-sounding word “still” is placed at the beginning of the last half of the line. Why does something so small matter? Imagine if it had been written “. . . . but I still don’t know why.” Say both out loud. Notice how the “still don’t know why” creates four emphasized hard-sounds in a row? The word order forces you to stop on each, and as a result, the last half of the line sounds aggressive. But, she’s not made. She’s confused. Writing the line as ” . . . but still I don’t know why” creates a smoother and more calm version of the line and it emulates her mood. Small nuances like this are key to creating songs that deliver your intended message. It’s a sad song – so minor chords aren’t a big surprise. But, the major chords are the trick here. They’re used in a way that adds a dimension to the song but doesn’t eliminate the pain. Major chords are used to elevate very specific lines briefly out of the despair to give relief to the speaker’s suffering. They are also used to highlight key lines of the speaker’s emotional evolution. For example, the third line of each verse offers a spark of self awareness in the words. It also acts as a pivotal line in the overall structure of each verse. It’s a point where, each time, the speaker takes a step toward understanding themselves. The mastery of the music is in the C -> Bm -> E chord progression. Musically, the line sounds completely different from the rest of the song, highlighting it as uniquely important to the lyric. Each implies an inkling of internal strength despite the loss of the speaker’s relationship. But the songwriters take you back to tone of the message as the verse ends with minor chords. This chord structure creates a dynamic shift into the chorus, which is dominated by major chords. But, before the song gets too giddy – it pulls us back into the overall mood created with the [Am] in the second line, emphasizing the pivotal moment between the pair: “What did you want it to be? He said it’s him or me. / The way you made it – . . ” then a change to major chords as if a statement of fact the speaker will learn to live with over time. I lost you a while ago, but still I don’t know why. I can’t say your name without a crow flying by. Got to watch my back now that you’ve turned me around. Got me walking backwards in my hometown. Throw me a rope on the rolling tide. What did you want it to be? He said it’s him or me. The way you made it – that’s the way it will be. In the Verse and Chorus, the phrasing is broken into two sections the first two lines (shown with a | in the lines), emphasizing “throw me a rope” and “rolling tide” in a way that’s similar to the Verse phrasing of short parenthetical phrases. What did you want it to be? | You said it’s him or me. The way you made it – | that’s the way it will be. This is a terrific device to emulate in your own songs, an relatively simple to do with big payoffs. Attention and variation to phrasing is a way to bring an emphasis to a line, a character, a key dramatic point or the hook in a way that also gives a rhythmic layer to the song. That’s right, I said it: the lack of a linear narrative to this song is a strength! I can only imagine the song critique Gillian would have gotten back had she turned this in to a traditional band of songwriters writing for the country genre. No “point A to point Z storyline” is a pat go-to when giving feedback. The trick is to know when it’s not a good idea. Welch uses a general visual, almost like an impressionist painting, to emote on behalf of the speaker. The music creates the mood, and you know the main character is in pain, but finding herself and working through being alone and the loss of the relationship. The song is most importantly about that character’s own discovery, not the story behind it. We know something happened to get them there. We’ve all probably experienced it – and since it’s secondary to the songwriter’s larger intent – no background needed. She and David also do a fantastic job of using the structure to highlight the evolution of the speaker’s emotional growth. The second chorus being after two verses gives the listener (1) time to understand the speaker’s change, and (2) creates a dynamic in the song that provides a bit of tension as the second chorus is withheld for just one more verse. V1: I’m still confused about why this all ended. CH: Give me something to hold on to. You created the situation, and now we’re both living with it. V2: You kick me out of your/our home because you couldn’t have a relationship that wasn’t one-sided. V3: Who you are will keep coming back on you, and I understood it. You might need that someday. CH: (Implied despite no word change) I can give you something to hold on to. You created the situation, and now we’re both living with it. TIP: As a songwriter, outlining your song can open up new structures because the structure ends up serving the message, or your intent for the song. Another great example of form following function. The internal rhyme and use of what I’ll call a faux anaphora in the song helps bring a haunting quality to the lyrics. Using a true anaphora, or direct repetition of a phrase at the beginning of a line, would have sounded a bit stiff given the music. Brilliantly, Welch uses a slight variation. As a result, she achieves the same effect, but avoids it sounding clunky in her lyric. I’m a big proponent of using rhyme patterns to their full advantage in a song. Gillian Welch and David Rawlings do that here with the first couplet (2 lines) in the first Verse [A] [A] tying directly to the Chorus by using the [A] rhyme at the end of the first line. Linking the Verse and the Chorus is a way to help the listener remain connected and seemingly move them through the song more quickly. With a BPM of 70, this rhyme pattern helps keep the song from dragging. Notice too that the rhyme pattern of the Verse and Chorus are different. This differentiates the two song parts and gives the song an additional dynamic. Also helping to maintain the pace is the use of internal rhyme. “Ago” / “know” / “crow” and “shore” / “door-to-door” help add texture and pace to the lyric while being unique but not contrived. Internal rhyme is a great device to add a steady flow to the lyric and help keep the song moving. Ideal for a slow tempo song like a ballad. Try different phrasing within a line, or breaking up a line using two phrases separated by a comma. This is one of the main reasons I add punctuation to my lyrics. Ultimately, punctuation helps indicate your stops, pauses and starts. Go ahead and read the last sentence out loud. Can you break down your lyric into phrases separated by a comma? Do you need to rewrite the line to do it? If you have a running line with no breaks, is it intentional and adds to the rhythm of the song? This practice of looking at your phrasing will also help you get out of writing the same melody lines all the time. Different phrasing rhythms and word choices force you to change how you’re singing something, impacting the melody. It’s an easy way to create some variety across your songs. Select two key lines in one of your songs. Now can you come up with a short two or three word phrase that would give the lines more connectivity to each other or the rest of the lyric if you started both lines with the phrase? This one is tough, because someone will tell you not to repeat the same words in your lines. However, it’s a great example of knowing the rules and then breaking them for a reason! Just make sure you have a reason. Your goal is to make the lyric/song stronger. Front of the line doesn’t work? Try using the same technique for the end of a line (epistrophe) similar to the “so mad/so bad” line endings in Verse 3. Use an outline before you start writing your next song. What’s the big picture message or intent you have for the song as the songwriter? Now what’s the best way, in an outline form, to convey that message? Do you need a bridge to add a twist or secondary message? “The Way It Will Be” is an impressive display of form following function. Elements of the lyric and music emulate and as a result amplify the secondary meanings in the song. One way to tell that a songwriter has spent time on the crafting of the song is to find the underlying complexities: the things you hear on the 10th and 20th listening. And why you make it to the 100th listening. Gillian Welch and David Rawlings do yeoman’s work to achieve this in almost every song they write, and it’s also why deconstructing their songs is something you may want to add to your songwriting regimen to help advance your skills.